It’s time to look at another Sherlock Holmes film. This one’s definitely a pretty intense mystery with a lot of suspects and various red herrings to keep you guessing. It’ll be rather difficult to sniff out the culprit here and even if you do you may end up mixing some of the suspects around since quite a few of the characters look really similar. Still, it’s the kind of case you would expect for Holmes since only a master detective can put it all together. He was enjoying a nice vacation over with Watson when a lady is murdered. It’s a tragic thing, but there doesn’t seem to be much of a mystery about it so the heroes prepare to go back to London. That’s when they receive a letter from the dead person before she passed asking for their assistance. Holmes officially puts himself into the case and must now find out who is using this claw to murder everyone. Surely there is some kind of explanation for it, but what can it be? You’ve got the local judge, the husband of the girl who was murdered, a maid, an old man with a shotgun, and a few other characters running around. 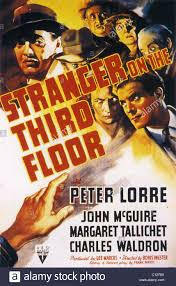 Holmes will have to tread carefully as even the slightest miscalculation could end up costing him his life. As always the writing and pacing for the film are on point. It’s entertaining from start to finish and the mystery should have you engaged. Sherlock Holmes always acts in a very professional manner and the cops give him his due credit. He can be a little extra sarcastic to Watson at times though. He’s not saying anything mean so don’t worry about that, but it’s pretty obvious that he is just tricking Watson into feeling like he is helpful most of the time. Other times Holmes will actually insult Watson to his face but in a subtle way so Watson doesn’t even notice. It wasn’t Watson’s best showing so I guess even Holmes got tired of that, but still worth pointing out. Watson is a lot of fun as always and it’s just easy to see why he has a lot of fans. “Rubbish” has started to become his main catchphrase. He is always muttering about something or other and I suppose he has good reason to grumble. He may be a doctor, but nobody really respects him all that much and they certainly don’t seem to buy into his intelligence. Watson ends up falling into a ditch multiple times which didn’t help his case, but at least he always means well. Watson is a very genuine person who speaks his mind. It just doesn’t often work out very well for him unless he is holding a gun. When in combat he is always ready. Usually Sherlock Holmes is the master of disguises, but in this film the main villain really took that role. His disguises were so intricate and detailed that he would really appear to be more than one person. Quite a few people had alternate forms here though as even the girl who died was actually another person. That’s why it could be tough to keep track of everyone since you had extra characters who were actually not characters at all and were merely trying to fool everyone else. You can’t trust anyone. In a sense the guy with the shotgun had the best idea. He knew that everyone kept dying so he decided to sit down on his char and get the gun ready. People don’t seem to die during the day so he’ll shoot anyone who tries to enter the room until the next day. He even pretends to have a bad leg to make the villain underestimate him. Unfortunately his whole plan was rendered moot as he decided not to have his chair actually face the door where the villain would come through. Isn’t that a terrible plan then? The whole point of a plan like this is to be able to see every direction from where the villains might come through. Otherwise there just isn’t much point to the plan at all and you might as well have just waited outside. Of course, this guy wasn’t exactly the smartest tool in the shed as Holmes warned him of his impending doom and the guy refused to listen. You should always hear Sherlock Holmes out. The ending of the film is also fairly unique as one of the suspects decides to take things into his own hands. Usually it is Sherlock Holmes who either captures the villain or forces him to fall into his doom or into the hands of the police. This time he really did lose the guy in the fog and was just fortunate that one of the other characters was around or the villain could have possibly escaped. I was also glad that the character didn’t go out like a 2 bit character and actually managed to block the Scarlet Claw. After all, that weapon is hardly long range so once you manage to grab the opponent’s hand it will lose most of its lethal potential. 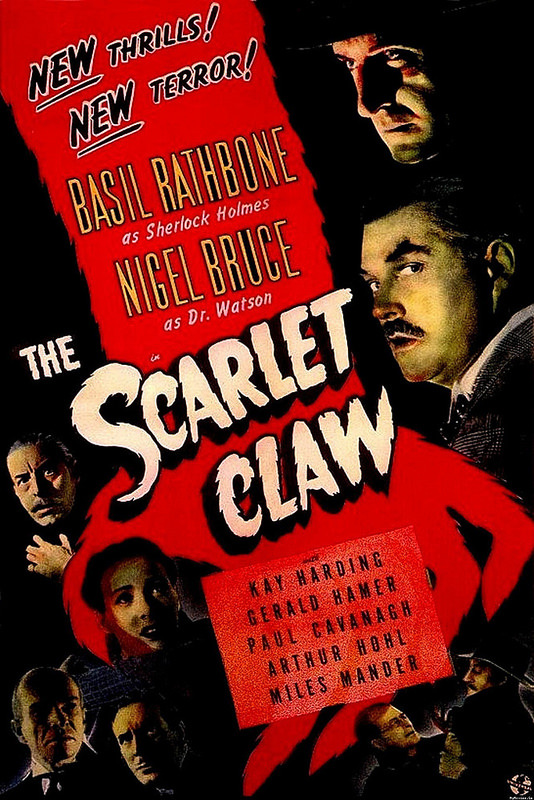 Overall , Sherlock Holmes: The Scarlet Claw is a really solid film. It’s probably the most thorough mystery of them all. (From the Holmes films that I’ve seen so far) While it’s still not as high ranked as some of the other mysteries thanks to the cast of suspects being a little less interesting, you can’t really ask for much more than what this film gives you. It has all of the classic Sherlock Holmes’ fundamentals in one clean package. Watson and Holmes still have a great dynamic as always even if I would like to see Watson win a verbal battle one of these days. He’s just too polite to properly defend himself though. It’s time for an old school mafia/gangster film. I haven’t seen too many of these yet so it’s nice to add another one to the list. It’s handled pretty well and makes for an interesting movie from start to finish. I think the main character could have been a little better to make it easier to root for him, but I suppose it was trying to show that he was just an ordinary joe who wanted to stick up for the paper. 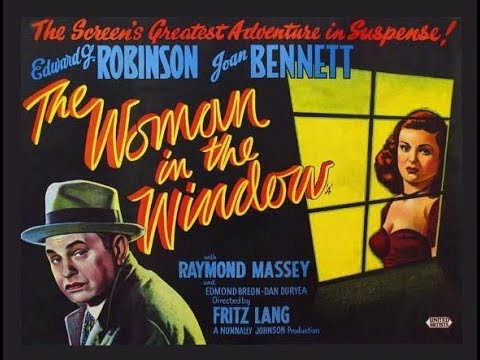 Bogart plays the role extremely well as always and it’s a film that has certainly aged well. Hutcheson is a proud newspaper man. He’s never gone for sensational clickbait over the actual news. He goes for the facts and just that. Unfortunately this means that his paper is losing sales and a competitor wants to buy him out to crush it for good. There’s not much Hutcheson can do about it since the board of directors are okay with the sale. He has enough time for one last scoop though and decides to attack the vicious gangster Rienzi after one of his reporters is attacked for following the story. Nobody gets to take down one of his staff, not while Hutcheson is still on the case. With all of the fake stories being spread around and alternative facts used instead of actual ones, this film is a good reminder that you have to be careful what you believe. All of the papers in this film were either paid off by Rienzi or were too scared to attack him. This meant that Hutcheson and his crew had to dig up all of the dirt on their own. Luckily, these guys are some of the best in the biz and were ready for such a challenge. Hutcheson is also a pretty confident and bold person himself so the villain’s threats never get to him. He defies the villains right up til the end and even if he is taken out of the picture, the facts have now been released for everyone. The film has a very sudden ending, but one that works well. You can reasonably draw your own conclusions from it and they are positive ones. While we may not have gotten an epilogue, you can see how things will go from here. It may have all come together a little too well in some cases though. For example, Hutcheson’s one flaw is that he’s typically drunk and a little crazy. He forgot that he was divorced to his wife for a while because he had one too many beers and once he remembered, he wanted to call it off. It was a little late for that as she already found the rebound guy. It turns out that the guy didn’t have any dirt on him even though Hutcheson tried to find it. By the end, the ex-wife realizes that she doesn’t want a new man and comes back. It’s nice for the lead of course, but that part was maybe a little over the top. It was the one subplot where I couldn’t sympathize with Hutcheson at all. He’s a great newspaper man, but that was part of the problem for his social life. He had very clear priorities and his ex-wife was apparently not one of them. As you’d expect from a newspaper film, the plot is very intricate and there are twists upon twists. More elements continue dug up by the reporters and then you get the full story at the end. It’s definitely a sad story all around, but one that will keep you guessing. It always seems like a fair mystery with my only issue being that some characters look really similar. For example, the rebound guy looked just like one of the gangsters so I was waiting for that twist. Rienzi is a decent main villain although he doesn’t get to appear all that much. He’s clearly a lot smarter than his minions, but it wasn’t enough as he gets outsmarted by the newspaper the whole time. The court scenes were pretty fun. There wasn’t much that the heroes could do there since the paper’s owners had already given their consent, but it was still nice to see. The court rooms definitely haven’t changed much at all as it looks like an exact replica to the one I sat in a while back. The Judge made the right call since an appeal to emotion isn’t the right way to win a case. One of the executives did stand up in the end though so the paper got to have a happy ending thanks to that. Hopefully sales pick up so she can gain back her money. 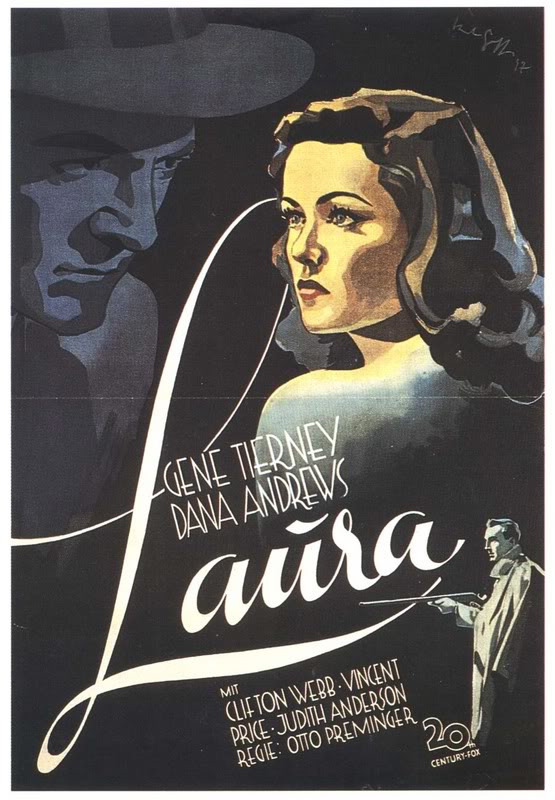 Again, old films like this one are so good because of the dynamic writing and plot. The script is leagues ahead of anything you’ll see in the modern day. The characters all feel very real and professional. While this may not always help Hutcheson, it does work well with the film. The plot was good and handled well as we got to see how a lone newspaper can deal with a gangster threat. They may have fallen for the fake cops gambit, but they controlled the game otherwise. All of the reporters were very good at their jobs and everyone brought something to the table. The only plot that the film should have cut out was the drama with the ex-wife. It didn’t eat up too much screen time though so at least it wasn’t a huge issue, just a minor thing that would have made the whole experience even better. 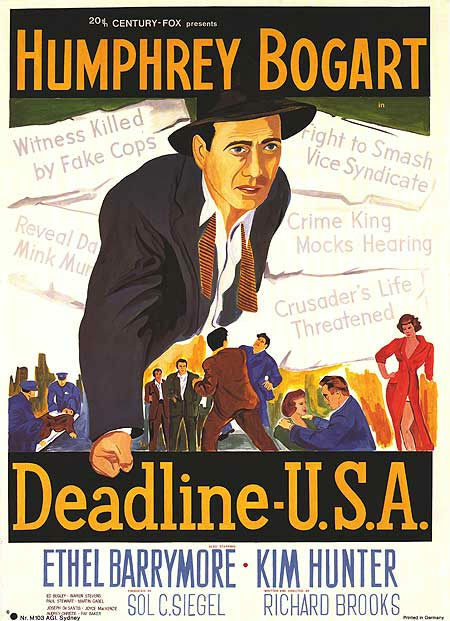 Overall, Deadline USA is a good film. It’s certainly one that I hadn’t heard of before so it was a nice hidden gem to find. The film’s not very long so the pacing never slows down. As one of Bogart’s final films, I can safely say that it was a good decision to be a part of it. The film certainly would have lost some charm and charisma without his inclusion. It’d still be a film, but some leads were just made for the roll and he did a good job here. For once he didn’t even get knocked out despite getting in a car with the villains. You definitely have to love that confidence. I highly recommend checking this film out. I’m afraid we’re in for another stinker folks! White Heat decided that maybe they could pass off a corrupt mobster as the charismatic main character and get away with it. They were wrong, not only can Cody not hold his own film, but this one ends up dragging quite a lot. It’s nearly 2 hours and that’s pretty crazy considering that this one came out in the 40’s. Whatever they were thinking with this film, it was not in the same train of thought that I had. Sorry folks, but there aren’t a whole lot of positives to say about this title. The cops have been after a guy named Cody for a very long time. This mobster is ruthless and his crimes against humanity must be stopped. The detectives decide to send an inside man into the jail to figure out why Cody has turned himself in and to stop his plans. Hank (The agent) doesn’t agree, but he is forced into the job and proceeds to follow the gang around. Will he have the heart to betray Cody or will he become corrupted. After all, hanging out with the wrong crowd can always be dangerous. One of the main problems with this is that Hank takes way too long to make a move. He really takes his directions to the letter here and follows Cody around from base to base. Quite a few people die as the gang goes through and Hank finally makes a move at the very end, but it took a while. He was still overpowered as well since he let his guard down. Not the greatest secret agent is he? Hank’s not even likable as he has to pretend to be a villain the whole time. He almost got away with it too, but it turns out that he had locked up one too many villains in his day so someone was bound to recognize him. Cody is a terrible protagonist. He’s the average villain that you would expect from back in the day, only he’s the main character so you have to see him a lot longer than you’d want too. He’s not very smart and doesn’t realize that someone tried to bump him off until someone spills the beans later on. He is able to fight off about a half dozen cops with a bait/punch combo that was pretty unrealistic. Still, it’s a feat for him I suppose, but physical strength doesn’t make up for the fact that he is not a very imposing villain. He’s prone to headaches and his minions could really betray him at any times. He gets the last laugh against some of them, but that just shows how weak the other villains are. He puts up a fight in the climax, but it doesn’t save Cody. If you got rid of the fact that he had a fake romance with one of the mobster girls then he would have risen up from horrendously bad to just very bad. I know he’s not that smart, but it was obvious that she was playing him and he seemed to know it at times. Cody’s Mom is easily the MVP from all of the villains. She talked tough and backed it up throughout the film. She may have bitten off more than she could chew by trying to take down a gang, but at least she was always prepared to fight until the end. She helped the villains get through a lot of tight spots with the police and she would have been a much more engaging lead than Cody. Even Cody’s rival probably would have been a cooler lead, but he was still a bad character so it wouldn’t be much of an improvement. As you can see, most of the cops were not all that helpful or even good at their jobs so I wouldn’t really say that any of them were particularly likable. Just watch how easily the villains get out of the jail and you’ll be face palming. The security defenses were quite bad to say the least. The government would not have been proud if they had witnessed the whole debacle. At the very least, the cops talk tough like when they interrogated the villains, but even then they were verbally destroyed by Cody’s Mom. Again, the film is two hours. Why is it two hours when this plot seems rather basic? Well, we have quite a lot of moments that are around to buy time. For example, the storm that hits the villain’s base. They stand around there for a while as the film gives us a lot of exposition and Cody starts to freak out. The scene goes on for quite a while to pad out the run time. 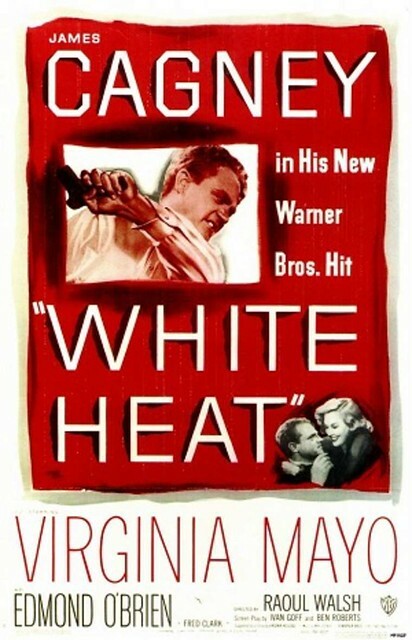 White Heat could have easily shaved off a good half n hour and nothing would really change, except that the film could have maybe been a little better. A different main character would be crucial to making a real difference here though. As per usual, you can tell that this film is really bad because it is not enjoyable. There are no fun scenes here or moments that will get you excited as you wait to see what will transpire next. White Heat never gets you engaged in the story and as a result, you’ll just be sitting there wondering when your next meal is going to occur or when the film will end. The best case scenario is that you start telling yourself how the film could have been better as the scenes go by. “Why wasn’t there any good music themes here” “Why are the characters not doing this?” etc. Overall, White Heat is a film best left on the forgotten shelf. It doesn’t know what it means to be a good film and it just kept on getting worse and worse. Making a film based around a villain is always going to be very tricky since it’s difficult to make a villain likable. Extremely difficult and even more so nowadays than it would have been in the classic era. The best chance is to make the villain rather mild and petty, going for Now You See Me type of crimes instead of giving someone like the Joker his own film. It’s a lot of trouble to make it good though so it’s a lot easier to just churn out Spider-Man 10 or Godzilla 79. If you want to see a good film where the main character isn’t a hero, check out Madoka Magica Rebellion. Prepare yourself for an epic ending!